Sometimes it is just hard to talk about bullying, especially for the bullied, with many of them keeping such bullying incidents to themselves. For an Australian family, they only learnt that their 10-year-old daughter was a victim of bullying after her brother accidentally stumbles upon a note she wrote on her Nintendo 3DS. 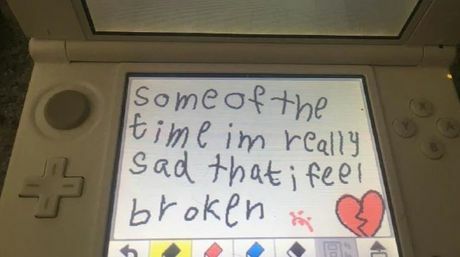 Using the 3DS’s game notes, the daughter wrote a heart-wrenching message about how she sometimes feel sad to the point of being broken which the family later found out was due to bullying. The handwritten message read: “Some of the time I’m really sad that I feel broken” finished with a picture of a broken heart. No one should ever suffer at the hands of bullying, be it in real-life or when gaming online. If you know someone who requires assistance or an open ear, why not hear them out and render assistance.